This listing is for 1 set x Rear seat covers (FREE headrest covers included). • The standard "half-back" design provides full protection on the front (backrest, bolster, cushion part) while maintaining access to original pockets behind the backrest (if any) by covering only the top section behind the backrest. "Full-back" option means behind the backrest is full-length covered. "Map pockets" option means pockets can be added to both passenger and driver sides. • The standard rear design covers up the armrest/cup holder (if any), making it inoperable. However, customers can request a zipped armrest cut-out so the armrest/cup holder can still be used (the armrest itself is not covered in most models as the thickness of material would make a cover too bulky to push back into the recess in the seat). • If your car has rear split seats (e.g. 40/60, or 50/50, or 40-20-40), the rear cover is in sections to allow the split portion still to fold / move independently with the covers fitted on. 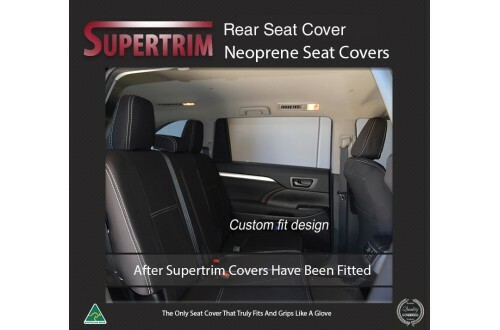 Automotive-grade premium neoprene (wetsuit) material is used for manufacturing seat covers supplied to car companies and car dealers in Australia. Tailor-made cover tightly shapes around the curves of the seat with no ties or straps needed. It grips to the seat and won't slide around, effectively protecting the original fabric/leather seats. Safe airbag deployment is achieved with the "split-open" airbag seam sewing technique, which is test certified by an Australian accredited test agency. Will the covers fit my car seats snugly as shown in the pics? Is it 100% waterproof? Does it sweat? Would it damage the original leather seat? Is it machine washable? 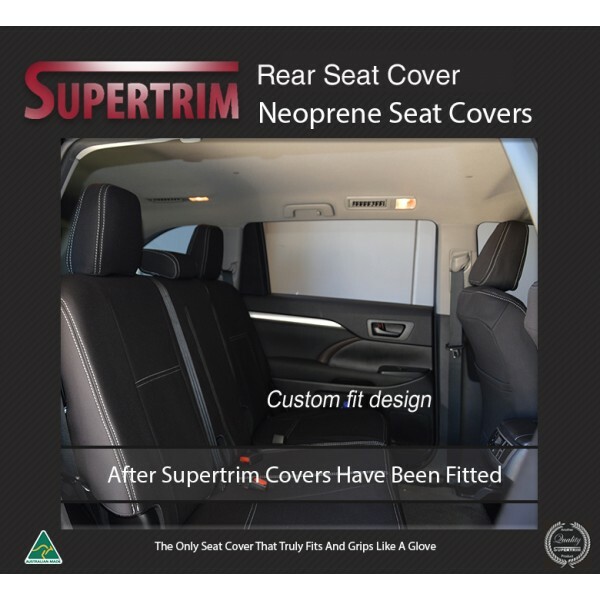 The premium neoprene material used is of heavy duty automotive grade 2.5 mm thick, UV stabilized, fade and abrasion resistant. The top layer is synthetic fabric which is comfy to sit on, the backing layer is soft rubber that grips to the seat and will not slide around when sitting on it. That’s why it won’t cause damage to the leather seat. The seat cover is machine washable in cold water cycle using mild detergent. Do not tumble dry. The cover may smell of brand new material but it will go away in a week or two after first use. You might want to wash it before use. Conditions apply, click here for details.